Alain Serges Kouadio and Tim Woods report on a major low-emission development project that is boosting energy access in Côte d’Ivoire by using many parts of the rice plant to create bioenergy. Much of Côte d’Ivoire’s recent economic progress has been based on its natural resource base. But the stock of natural resources diminished by 26% between 1990 and 2014 due to factors including deforestation, depleted water reserves and coastal erosion. If left unchecked, climate change will exacerbate this decline in the natural resource base – with severe consequences for the country’s economy. According to the Intergovernmental Panel on Climate Change, climate change could reduce GDP across Africa by 2–4% by 2040; for Côte d’Ivoire, this would correspond to a loss of CFAF 380–770 billion (US$0.66–1.34 billion) in 2040. Livelihoods are also at risk. Almost 7.5 million people live along its coastline and this region contributes close to 80% of the country’s gross domestic product (GDP). But two thirds of the coastline is at risk from coastal erosion, which threatens productivity. For example, Côte d’Ivoire is the world’s leading cocoa producer: the crop comprises one third of all its exports and employs many people, but production is concentrated in the coastal regions. To counter these alarming threats, the government has set out a clear ambition: to pursue climate-compatible development. This will support further economic growth and diversification while ensuring that the country plays its part in the fight against climate change. Low-emissions development pathways are integral to this ambition. Côte d’Ivoire’s Intended Nationally Determined Contribution (INDC) and its accompanying National Strategy for Combating Climate Change 2015-2020 have a clear message: the country intends to move beyond an economy based on natural resources and industrialize – but also reduce its carbon footprint by “favouring mitigation options with high co-benefits”. The government has set a target of cutting emissions by 28% by 2030 (relative to 2012), and outlines several ways to achieve this. “We have three priorities,” says Alain Serges Kouadio, Director of the Green Economy at the Ministry of Sustainable Development in Côte d’Ivoire. “Firstly, we need to decouple climate change from agricultural development, so it can prosper without causing high emissions. Côte d’Ivoire’s INDC states that the political will to reduce emissions is there – but that the planned actions will need support from technical and financial partners. One strategic partner is LEDS GP. Its work in Côte d’Ivoire, run through the Africa LEDS project, is helping the country to address all three priorities. Under its ‘LEDS Planning and Implementation Support’ component, LEDS GP has helped Côte d’Ivoire to secure technical and financial partners for two major projects, including the Food and Agriculture Organization of the United Nations, the European Union and UN Environment. Côte d’Ivoire is also participating in annual LEDS GP meetings and supporting the establishment of communities of practice to share lessons and knowledge. One project, coordinated by ANADER, is a sustainable agriculture initiative to explore the production of organic fertilizer and clean energy from agricultural waste – specifically rice farming. Rice is grown across Côte d’Ivoire, mainly for local sale and consumption, and this initiative aims to educate and train rice growers in two villages, Tipatipa and Tiétiékou, about agricultural practices that emit fewer greenhouse gases. An early meeting of the project’s steering committee opted to focus on the production of biogas and biofertilizer from rice straws (the stalks left after harvesting). However, an initial study revealed that this was not feasible from a financial perspective. Instead, the project switched to producing fuel briquettes from rice husks (the hard covering of the grains) – see photo, below. A production unit for briquettes was established, and research undertaken to compare their emissions – throughout the whole production process – with those of traditional charcoal briquettes made from wood. This was essential: to contribute to Côte d’Ivoire’s commitment to low-emissions pathways, they needed to have a positive net effect on overall emissions. Encouragingly, initial findings suggest the rice briquettes have emissions far lower than charcoal burning. Projecting to 2050, this could save more than 3 million m3 of wood from forests being burnt. 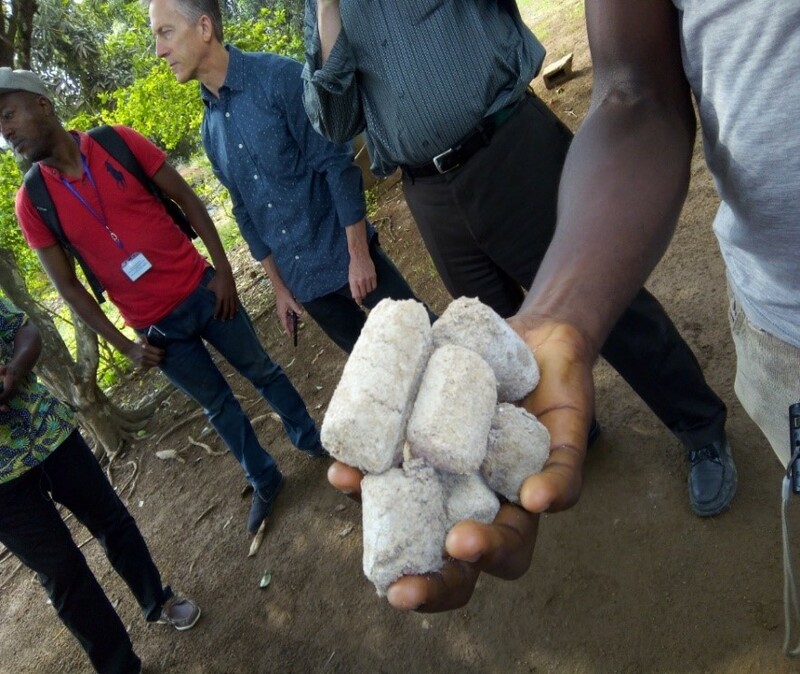 A future activity for the project will be to conduct a carbon assessment of the whole production process to establish if the rice briquettes are fully carbon neutral. This circular waste-to-energy approach has further benefits, such as providing an alternative energy source; it should also support economic growth by creating jobs. The next step will be to further improve the quality of the rice briquettes (e.g. treating them by pyrolysis) so they contribute even more to reducing emissions. A study to explore their potential market and social acceptability is also under way in Gagnoa, a city in south-central Côte d’Ivoire. While the rice briquettes offer a promising way to reduce emissions from agricultural waste, there will be little net gain if emissions continue to grow elsewhere in the agriculture sector. Therefore, alongside this waste-recovery initiative, rice farmers in the two villages are being trained in low-emissions agricultural techniques. Through demonstration sites, the project will highlight further potential uses of agricultural waste (e.g. biofertilizers) which can bring further benefits to rice farmers while reducing greenhouse gases. A second component of the Africa LEDS project, ‘LEDS Modelling Support’, is evaluating the long-term impacts of different approaches in Côte d’Ivoire. Using different models, researchers are testing various LEDS options in terms of their emissions savings, socio-economic benefits and macro-economic indicators (e.g. jobs created). The models being used are the EX-Ante Carbon balance Tool (EX-ACT); the LEAP model for planning long-term energy alternatives; and the CCS tool, which can measure the economic impacts of different low-carbon scenarios. In one exciting development, the models are being used to compare the impacts of burning rice straws after harvesting (the current practice) against a project that shifts to a ‘no burning’ system. This found that implementing the project – i.e. not burning – could reduce greenhouse gases by 2,144 tonnes of CO2 equivalent, or around 16%, over 20 years at the site (around 150 hectares). These lower emissions were realized partly because the rice straws are ploughed back into the soil, rather than burned. Further, this technique means less mineral fertilizer is needed, reducing the emissions associated with fertilizer production. Combined with the fuel briquettes, this means that all waste products – straws and husks – can be used in a way that reduces the emissions from rice farming. Once this and other modelling processes have been completed, the results will be integrated. For example, data from the EX-ACT and LEAP models will be used as inputs for the CCS tool to evaluate the macroeconomic impacts of different initiatives. This will create a range of long-range low-emissions simulations for the government to consider. The experience of using these models will also reinforce the national capacity for scenario-planning, benefitting the country’s climate planning and research in the future. The projects being run with LEDS GP’s support offer great promise, though. They are providing practical solutions – such as replacing charcoal with rice briquettes – that lead to verified emissions reductions. The project should also provide policy-makers with integrated models that can be used to formulate better climate policies. This will ultimately mean that Côte d’Ivoire is better placed to achieve the low-emissions ambitions set out in its INDC and National Strategy. LEDS GP’s country page on Cote d’Ivoire. Ministry of Environment and Sustainable Development (2018). Op. cit.